J.H. 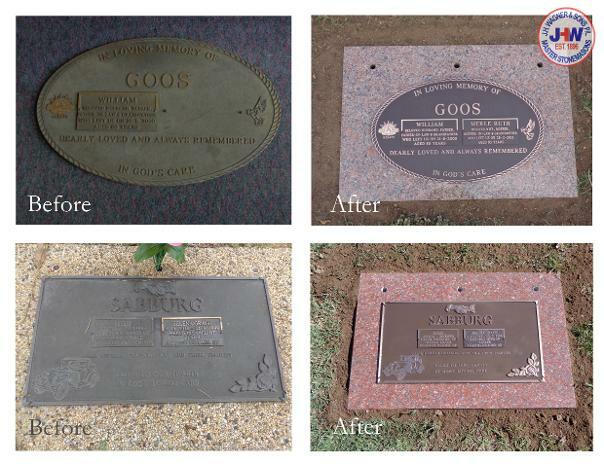 Wagner & Sons can refurbish existing bronze plaques. Bronze is a very durable cast metal but long term exposure to the elements may leave your plaque needing some 'TLC' from J.H. Wagner & Sons. When initially supplied from the foundry, the bronze plaque will have a clear lacquer coating which will enhance the shine of the bronze, especially where the bronze has been linished (sanded) on the lettering, motifs and border. Over time, this clear lacquer coating will wear off, allowing the bronze to naturally patina or darken in colour. The bronze letters will still retain legibility but will not have the same shine as when the plaque was first installed. J.H. Wagner & Sons offer a service to re-furbish your existing bronze plaque which includes a cleaning process, linishing and re-coating with the clear lacquer. While plaque restoration is not a process which must be carried out to maintain the bronze, we highly recommend re-furbishing to restore the bronze plaque to the best available finish. Where possible we will complete the re-furbishing within our factory, however if this is not possible we can offer re-furbishing works on site.